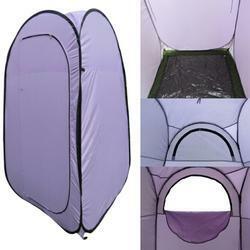 Manufacturer of a wide range of products which include folding dress changing room-blue, folding dress changing room-light purple, portable toilet, camping trekking outdoor automatic tent -3 people-camouflage, camping trekking outdoor tent -7 people-tw6 and camping trekking outdoor tent. Folding dress changing room is made of oxford fabric & highly retractable steel wire frame with a wide opening zipper gate. This changing room is fully covered from all sides except bottom. Bottom is open. 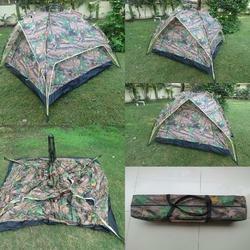 It is a very light weight product and can be folded and unfolded in seconds and very easy to carry while traveling. Supplied with a zipper carry bag. 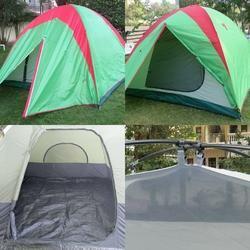 Converts into a small round ring shape after folding.,materials used :fabric :190t polyester ,frame : highly retractible steel wire frame Absolutely non transparent fabric,applications :,used as a dress changing room ,can be used as a urinal in camping ,can be used as a privacy shelter ,can be used in a garment show room having low space ,most suitable for outdoor photography,modelling photography,film shooting etc. Dimensions :120 cms x 120 cms x 190 cms height. COLOR- LIGHT GREEN, Size : 36 x 40 x 42 Cm Height. Weight - 5.6 Kg. HAND WATER SPRAY GUN IS A STANDARD SUPPLY WITH THIS PRODUCT. Material: H.D.P.E. (High Density Polyethylene). Weight Bearing Capacity- 120 Kg. Facilities : Top seat and water tank can be separated from bottom sump releasing side snap type brackets for cleaning. Discharge of collected waste can be carried out through large drain passage opening a threaded cap at the back side. Flush water can be obtained by repeatedly pressing a rubber bellow. Bad odor can be restricted closing sliding gate, when toilet is not in use. Design Construction : Integrated seat and water tank having capacity of 12 lit.. , Water can be filled from top through inlet passage provided with cap. Waste is collected at the bottom in a septic tank/Sump. 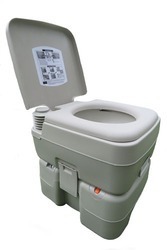 Septic tank can be discharged though outlet passage by opening a cap. Septic tank can also be cleaned by splitting apart upper and lower part clicking side snap type brackets. Water discharge outlet provided within the tub. Push-pull arrangement provided to open and close potty hole to restrict odor emission. Top tilting seat cover flap provided for tub. SIZE : 36 cm x 42 cm x 40 Cm Ht. WEIGHT- 6 Kg. Features : Can easily be carried while travelling. Very light weigh for easy handling. Strong enough to take weight up to 120 kg. Opens automatically. 100% water resistant, double layer. Can be erected/opened and closed in 2 minutes. Easily portable. Ideal family tent. Wide open 2 gates. Wide mesh fabric gates on 2 walls in inner shell provides high ventilation and protection from mosquitoes and insects. Suitable for 3 people to sleep. Inner shell : PU coated 210T rip stop polyester - water proof fabric. Fly sheet : PU Coated 210T rip stop polyester - water proof fabric. Poles/frame: Automatic fiberglass poles -8.5 mm Cross Section. Weight : 1.50 Kg. Size: (85+285+85)x280x180 Cm. Weight - 7 Kg. 100% water proof double layer can be constructed easily. Easily Portable- ideal family tent. Wide open gate. Separate mosquito net zipper gate. 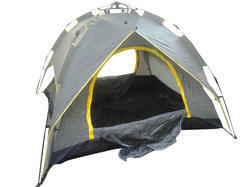 Fully ventilated inner main shell with 2 mesh windows. Stronger, durable pole frame. Suitable for 6-7 people to sleep. Materials used : main shell : 190t- premeable polyester. Outer shell : 190t - 2000 mm alu. Polyester fabric floor : 150D (pvc+polyester) Poles : 11 mm cross section F.R.P. Poles- 3 pcs. Dimensions : (85+285+85)x280x180 cms height. Weight : 7 kgs. Size: 305 x 305 x 180 Cm Height. Weight - 5 Kg. Suitable for 7-8 people to sleep. Sufficient height of 6' provides great comfort. 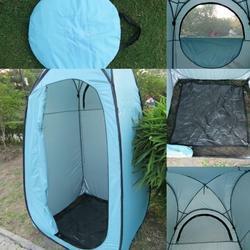 100% water proof double layer tent can be constructed easily easily. Portable ideal family tent. Wide open gate, separate mosquito net zipper gate, fully ventilated inner main shell with 2 mesh windows provided with opening mesh window at back suitable for 6 people to sleep. MATERIALS USED : main shell : 170 T polyester fabric. Outer shell : 190 T P.U. 800 mm polyester fabric. Floor : poly ethylene (p.e.) 10*10 fabric. Poles : 9.5 mm cross section f.r.p. Poles- 3 pcs. DIMENSIONS : 305 x 305 x 180 Cm. height. Weight : 5 kg. Our Trekking Bag (Back Pack) is the widely demanded product. This range is ideal for excursions and outings. It is manufactured using finest quality material in tandem with international quality standards. There are several pouches and pockets in this bag to carry essential utilities and equipment related to trekking/hiking. This product comes with a front zipper pocket to store travel documents and other important papers. Rear main compartment to store clothes and regular utility items. A front attached pouch is provided with a wide belt and can be separately used as a daily utility purse. Materials Used : P.U.Coated canvass fabric. Nylon inner lining Key features : Longer life Durable material. Stylish design Provided with 2 side zipper pockets and 1 zipper pocket at top Provided with front detachable pouch - can be used separately hanging by shoulder strap. 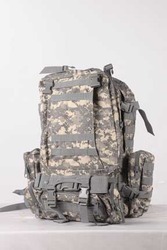 Provided with many stitched slots to accommodate trekking instruments Strong 2 back pack belts with soft padding Back part provided with soft padding for comfortably carrying. Detachable side 2 pouches Size : 52 x 57 x 24 Cm (Main Back Pack) Size - 33 x 19 x 13 Cm(Detachable front Pouch) Weight : 2.150 Kg. L.E.D. 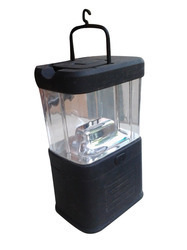 Lantern : Made of plastic outer body and highly reflective inner surface deliers very bright illumination of white light which is distributed evenly to enlighten and cover maximum area. The bright light of this lantern makes it possible to read with the help of its light. L.E.D. ensures longer life of the batteries. Small lantern uses 3 Nos. of AA- HR6 (1.2 V) batteries. Big Lantern uses 3 Nos. of R20 (1.5 V) batteries. 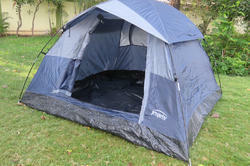 Double layer spacious tent to accommodate 3 people to sleep. Light weight Tent. Dimensions : 200 x 200 x 130 Cm., Weight - 1.750 Kg. Inner Shell : PU coated 210T Rip Stop Polyester - Water proof fabric Fly Sheet : PU Coated 210DT Rip Stop Polyester - Water proof fabric Poles/Frame : Automatic Fiberglass poles -D 8.5 mm Weight : 3.150 Kg. Opens automatically. 100% water resistant double layer. Can be erected/opened and closed in 2 minutes. Easily portable. Ideal family tent. Wide open 2 gates. Wide mesh fabric gates on 2 walls in inner shell provides high ventilation and protection from mosquitoes and insects. Suitable for 3 people to sleep. Can also be used as a beach side canopy with side open walls. MATERIALS USED : Inner shell : PI coated 210T polyester - 2000 mm water resistant fabric FLOOR : PU coated 210D oxford 3000 mm water resistant fabric. Poles/frame: Automatic fiberglass poles -8. Materials Used : Main Shell : 190T- PU, 1000 mm Polyester Fabric Inner : 170T Premeable Polyester Fabric Floor : P.E. - 10*10 Poles : 8.5 mm cross section F.R.P. Poles- 2 Pcs., 9.5 mm cross section F.R.P.Poles-2 Pcs. Dimensions : (130+180+130) x 220x185 Cms Height Weight : 7 Kgs. To be constructed using 2 nos. Cross f.g. Poles. 100% water resistant double layer. Can be erected/opened and closed in 5 minutes. Easily portable. Ideal tent for couple. Wide open 2 gates. Suitable for 3 people to sleep. 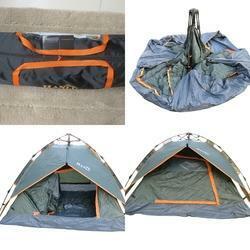 Materials used : Inner & outer fly sheet : 170T, 450 mm polyester fabric , Floor : P.E. 10*10. Poles/frame : 7.9 mm cross section f.g.poles - 3 nos. Weight : 2 kg. Material: P.U.Coated Canvass Fabric. Nylon Inner Lining. Self inflatable mattress is made of quality material with special technique and design to be used while travelling, camping , trekking. 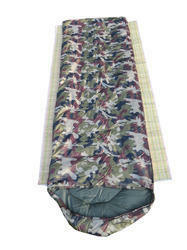 Can be used as a base support to sleep in a tent with a sleeping bag.